What Day Of The Week Was January 31, 1944? 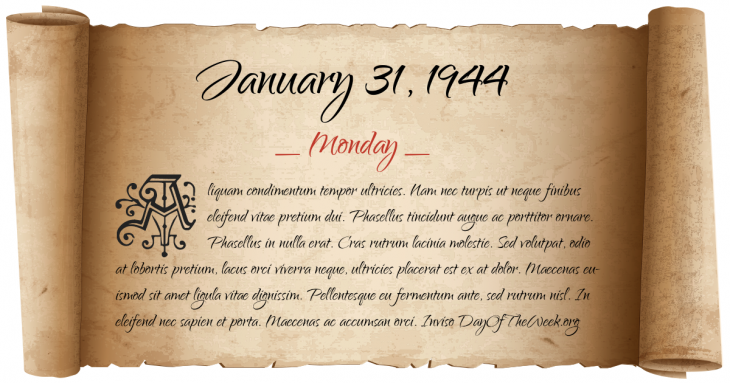 January 31, 1944 was the 31st day of the year 1944 in the Gregorian calendar. There were 335 days remaining until the end of the year. The day of the week was Monday. A person born on this day will be 75 years old today. If that same person saved a Nickel every day starting at age 4, then by now that person has accumulated $1,300.55 today. World War II: During Anzio campaign 1st Ranger Battalion (Darby’s Rangers) is destroyed behind enemy lines in a heavily outnumbered encounter at Battle of Cisterna, Italy. Who were born on January 31, 1944?